Card Customization is a system which allows you to use additional cards on top of your character's deck through the use of card packs. Below you'll find terms and definitions on how to use this system. Card Series: Each Series will consist of up to 12 cards. Rarity is measured with stars: 1 (most common) to 5 stars (rarest). Each series contains a different element. For example, Ice Series will contain Ice element cards. Card Packs: Each time you purchase from the Card Series you will randomly be given 5 cards from the series. Soul Gem Packs have more chances to get rare cards, and guarantee at least one high ranking card. These can be bought for 15,000 Gold or 4 Soul Gems. Battle: These cards are mixed in with your character cards in battle. 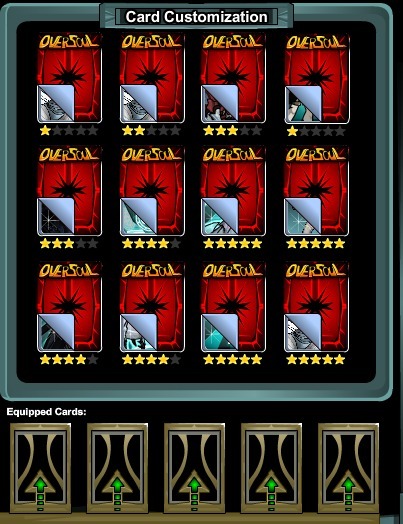 They are separate from your characters' cards and are used with any character you have equipped. Note: These cards are given ratings from 1-5 stars to signify Rarity.